Thirty years after being imprisoned by the United States government because of the happenstance of his ancestry, Norman Y. Mineta helped change forever the inner workings of the United States House of Representatives. Over a 20-year career in the House, the San Jose Congressman worked to make the federal lawmaking process more accountable. From the federal budget to the nation’s highway system, Mineta and his generation of reform-minded legislators redefined expectations on Capitol Hill. With the moral authority derived from having been unjustly incarcerated as a child, Mineta convinced Congress to address wartime internment and helped the country understand the sins of its past. Back home, Mineta enrolled at San Jose High School and served as student body president during his senior year. He stayed close to home for college, graduating from the University of California, Berkeley, in 1953 before serving three years as an Army intelligence officer during the Korean War.8 When he returned to San Jose, Mineta joined his father’s insurance firm and began exploring a possible entry into local politics.9 Mineta had two sons, David and Stuart, with his first wife. When he married his second wife, Danealia, the Congressman welcomed two stepsons, Bob and Mark Brantner. Mineta’s early congressional career illustrated just how successful his class was at reforming internal House procedure, especially the committee system. With O’Neill serving as Speaker and the seniority system under attack, Mineta’s leadership prospects improved rapidly. In only his second term during the 95th Congress (1977–1979), Mineta was appointed chairman of the Public Works and Transportation Committee’s Subcommittee on Public Buildings and Grounds, marking the start of a long reign as a subcommittee chairman. 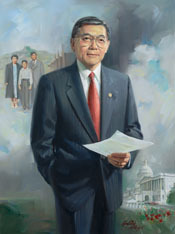 In fact, from 1977 until he became chairman of the full Public Works and Transportation Committee in 1993, Mineta served as chairman of four Public Works subcommittees over the course of eight consecutive Congresses : the Subcommittee on Public Buildings and Grounds (95th Congress), the Subcommittee on Oversight and Review (96th Congress [1979–1981]), the Subcommittee on Aviation (97th–100th Congresses [1981–1989]), and the Subcommittee on Surface Transportation (101st–102nd Congresses [1991–1995]). Mineta jumped to the Subcommittee on Aviation in the next Congress, starting what would become an eight-year reign as chairman. His subcommittee work reads like a deeply researched market summary of the airline industry, one that prioritized safety and its long-term viability. More than anything, Mineta wanted to make sure the Federal Aviation Administration and other regulatory agencies had the resources they needed to ensure the safety of airline passengers. Mineta tallied a number of early legislative victories on Aviation, often using his expertise in the budget process to his advantage. As part of the budget reconciliation in 1981, Congress agreed to the Airport Development Authorization Act, which included $450 million for new and improved airports. A year later, Mineta helped attach the Airport and Airway Improvement Act to the Tax Equity and Fiscal Responsibility Act of 1982, providing nearly $20 billion from an industry trust to help limit “wide-spread congestion and delays” at America’s airports.58 Over the next six years, two dozen bills that went before Mineta’s Aviation Subcommittee became law. Mineta pooled his two decades of experience on Public Works and Transportation and took over the gavel as chairman of the committee for the 103rd Congress. Having led four different subcommittees during his tenure on Public Works, he was fluent in the policy and deeply connected to the issues. As chairman, Mineta ruled a vast and influential empire. Public Works and Transportation was the largest committee in the House during the 103rd Congress, bigger than either the spending or tax-writing committees. Seven other Californians served with him (three Democrats and four Republicans), and 30 of the 50 states as well as the U.S. Virgin Islands and the District of Columbia were represented on the committee.64 His jurisdiction included flood control, roads, bridges, dams, public buildings—everything from airports to post offices to the Smithsonian Institution. Mineta’s focus as committee chairman was to prepare the government to meet the sure-to-be weighty demands of the upcoming 21st century. More than anything, he felt the need to make up for lost time. The Cold War had dominated America’s discretionary spending for decades, and money that might have gone to improve the country’s infrastructure went elsewhere. “Maintenance, new technologies, and leadership suffered often because, in real terms, we had to try to do more with less,” Mineta remembered. While some of the legislation was as simple as naming post offices or courthouses, Mineta’s committee could generate large amounts of goodwill simply by approving a new road or bridge for a Member’s district. Mineta guarded this jurisdiction closely, and in 1993, during the annual appropriations process, he got into a very public turf war with Representative Bob Carr of Michigan, who chaired the Appropriations’ Subcommittee on Transportation. Congressional authorizers like Mineta determine which agencies and which programs receive federal funding, while appropriators like Carr dole out money for the upcoming fiscal year. After Republicans swept the 1994 elections and took the majority in the House for the first time in decades, Mineta retired from Congress on October 10, 1995. He worked in the policy shop of a major defense contractor after leaving the House, and in 2000 President Bill Clinton named him Commerce Secretary. After two years in the Clinton administration, Mineta joined the George W. Bush administration as Transportation Secretary—the only Democrat in Bush’s Cabinet—serving from 2001 until 2006. “There are no Democratic or Republican highways,” Mineta liked to say, “no such thing as Republican or Democratic traffic congestion.”77 Shortly after Mineta stepped down, President Bush awarded him the Presidential Medal of Freedom for his years of public service. Mineta has since retired from public life. 1Hearings before the House Committee on the Judiciary, Subcommittee on Administrative Law and Governmental Relations, Civil Liberties Act of 1985 and the Aleutian And Pribilof Islands Restitution Act, Part I, 99th Cong., 2nd sess. (28 April 1986): 35; E. Michael Myers, “Congressman Mineta Recalls the Days When the Constitution Failed,” 22 May 1988, Los Angeles Times: 2; Ken Ringle, “The Patriot: Norm Mineta Was Interned by His Country, but Still He Loved It. Then He Changed It,” 21 August 2000, Washington Post: C1. 2Sam Chu Lin, “Working For the People: Norm Mineta Wraps Up More Than Two Decades of Public Service,” 6 October 1995, AsianWeek: 10; Johanna Neuman, “Profile: Norm Mineta; What Moves Him?,” 25 April 2005, Los Angeles Times: B2. 4David M. Kennedy, Freedom from Fear: The American People in Depression and War, 1929–1945 (New York: Oxford University Press, 1999): 748–760. 5Neuman, “Profile: Norm Mineta; What Moves Him?”; Betty Cuniberti, “Internment: Personal Voices, Powerful Choices,” 4 October 1987, Los Angeles Times: 1. See also Irvin Molotsky, “Washington Talk: Friendships, The Heat of War Welds a Bond That Endures Across Aisles and Years,” 26 April 1988, New York Times: A22; Frank Davies, “Mineta, Ex-Senator Forged Ties at Internment Camp,” 2 May 2008, San Jose Mercury News: n.p. 6Hearings before the House Committee on the Judiciary, Subcommittee on Administrative Law and Government Relations, Japanese American and Aleutian Wartime Relocation, 98th Cong., 2nd sess. (20 June 1984): 74. 7Norman Mineta, oral history interview by Ronald Sarasin, 11 September 2006, accessed 8 April 2016, transcript, U.S. Capitol Historical Society, Washington, DC: 4, http://www.uschs.org/oralhistories/ uschs_mineta.htm (site discontinued). 9“3,000 (Over 18, Under 21) Cast First Ballot Today in Maryland,” 13 April 1971, New York Times: 26; “Little Sway by Young in Md. Vote,” 15 April 1971, Boston Globe: 31. 10David S. Broder, Changing of the Guard: Power and Leadership in America (New York: Penguin, 1981): 54. 11Norman Mineta, “San Jose Mayor Finds Role of Parties Waning,” 16 December 1971, Washington Post: A14; Broder, Changing of the Guard: 54. 12“Norman Yoshio Mineta,” Biographical Directory of the United States Congress, 1774–Present, http://bioguide.congress.gov/scripts/ biodisplay.pl?index=M000794. 15“Men and Events,” 18 April 1971, Los Angeles Times: C5. 16Almanac of American Politics, 1976: 75; Art McGinn, “Can Towns Bar Their Gates?,” 10 February 1974, Atlanta Constitution: C6; Gary Blonston, “Houses Achangin’, Not for Better,” 16 February 1975, Baltimore Sun: F1; David Homstrom, “Mayors Strike Gold—Citizen Involvement,” 1 December 1971, Christian Science Monitor: 1. 17John Herbers, “Despite Problems, Cities Produce Vigorous Mayors,” 14 June 1971, New York Times: 18; “Revenue Share Consideration Set in Congress, Mayors Told,” 18 January 1972, Atlanta Constitution: A9; “Mills Quoted as Predicting Action on Revenue Sharing,” 9 March 1972, New York Times: 33; Peter Negronida, “Daley Leader: Mayors Back Nixon Policy,” 22 June 1972, Chicago Tribune: 2; John Herbers, “Mayors, In Shift, Back War Policy,” 22 June 1972, New York Times: 1; “16 Mayors Meet With Nixon,” 25 July 1972, Los Angeles Times: 2; Martin F. Nolan, “Mayors Fear Bankruptcies Spreading in Public Housing,” 7 September 1972, Boston Globe: 8; Maurice Carroll, “Mayors Tour City and Assail Nixon For Cuts in Funds,” 5 February 1973, New York Times: 1; Richard L. Strout, “Mayors Call Nixon Budget Cuts ‘Double Cross of City Poor,’” 24 February 1973, Christian Science Monitor: 2. For a general account of this generational change, see Broder, Changing of the Guard. 19Garrison Nelson, Committees in the U.S. Congress, 1947–1992, vol. 2 (Washington, DC: Congressional Quarterly Inc., 1994): 620–621; Garrison Nelson and Charles Stewart III, Committees in the U.S. Congress, 1993–2010 (Washington, DC: CQ Press, 2011): 854. 20Richard L. Lyons, “The New House: Members Mostly Lawyers, More Liberal, Younger,” 1 December 1974, Atlanta Constitution: 2K; “New Members Bring Slice of Life to House,” 11 November 1974, Chicago Tribune: 7. 21Mineta, oral history interview: 8. 22John A. Farrell, Tip O’Neill and the Democratic Century (Boston: Little, Brown and Company, 2001): 384–386; John A. Lawrence, “The Democrats’ High-Water Mark,” Politico Magazine, http:// www.politico.com/magazine/story/2014/11/the-democrats-highwater- mark-came-40-years-ago-112492_Page2.html (accessed 13 January 2017). 23Paul Houston, “Hopes Dimmed: Set Backs Give Freshman New View of House,” 22 June 1975, Los Angeles Times: A1. 24Robert Reinhold, “12 Go to Harvard to Study for Jobs in New Congress,” 14 December 1974, New York Times: 31; Farrell, Tip O’Neill and the Democratic Century: 400–402. 25Richard Lyons, “Caucus Chief Mineta Adopts Activist Role,” 5 July 1975, Washington Post: A3. 29Paul Houston, “5 Newcomers Give Vote of Confidence to Albert,” 17 June 1975, Los Angeles Times: A19. 30Lyons, “Caucus Chief Mineta Adopts Activist Role”; Mineta, oral history interview: 3–4. 31Tip O’Neill with William Novak, Man of the House: The Life and Political Memoirs of Speaker Tip O’Neill (New York: Random House, 1987): 272; Martin Nolan, “O’Neill Views Speaker’s Role,” 14 June 1976, Boston Globe: 1. 32Majorie Hunter and David E. Rosenbaum, “Defeats Split Bitter House Democrats,” 2 July 1975, New York Times: A1. 33Hunter and Rosenbaum, “Defeats Split Bitter House Democrats”; Mary Russell, “Freshmen Feel Frustration,” 27 October 1975, Washington Post: A1. 34Jerry Cohen, “Public Is Watching Politics Closer Now,” 1 January 1976, Los Angeles Times: OC1. 35Donald C. Bacon, Roger H. Davidson, and Morton Keller, eds., The Encyclopedia of the United States Congress, vol. 1 (New York: Simon and Schuster, 1995): 209; Eric Patashnik, “Congress and the Budget since 1974,” in The American Congress: The Building of Democracy, ed. Julian E. Zelizer (Boston : Houghton Mifflin, 2004): 671–672. 36Hearings before the House Committee on Rules, Task Force on the Budget Process, Congressional Budget Process, 97th Cong., 2nd sess. (15 September 1982): 2. 37David S. Broder, “Democratic Party in Transition, but the Question Is, to What?,” 14 January 1979, Washington Post: A1. 38Richard L. Lyons, “On Capitol Hill,” 25 January 1979, Washington Post: A2. 39Edward Walsh, “Administration Continues Its Search for Appointees to Fill Top Positions,” 25 July 1979, Washington Post: A7. 40David Rogers, “The Scent of Change is Strong,” 16 November 1980, Boston Globe: 49; Mary Russell, “Democrats’ Chairs,” 11 November 1978, Washington Post: A1; Ellen Hume, “California Lawmakers Jockey for Position,” 27 November 1980, Los Angeles Times: C1. 41Broder, Changing of the Guard: 54. 42Congressional Directory, 95th Cong. (Washington, DC: Government Printing Office, 1977): 17; Congressional Directory, 97th Cong. (Washington, DC : Government Printing Office, 1981): 17; “House Committees, 97th Congress, First Session,” CQ Almanac, 1981, 37th ed., (Washington, DC : Congressional Quarterly, Inc., 1982): 82, http://library.cqpress.com; “House Party Committees, 99th Congress,” CQ Almanac, 1985, 41st ed. (Washington, DC: Congressional Quarterly, Inc., 1986): 73-G–76-G, http://library.cqpress.com. 43Margot Hornblower and Richard L. Lyons, “House GOP Picks Michel As Leader,” 9 December 1980, Washington Post: A1; John Jacobs, A Rage for Justice: The Passion and Politics of Phillip Burton (Berkeley, CA: University of California Press, 1995): 478. 44“Democrats in Full Control for 100th Congress,” CQ Almanac, 1986, 42nd ed. (Washington, DC: Congressional Quarterly, Inc., 1987): 3–7, http://library.cqpress.com; Congressional Directory, 103rd Cong. (Washington, DC : Government Printing Office): 478. 45Lou Cannon, “The Independent Democrats,” 23 May 1977, Washington Post: A1. 46Hearings before the House Committee on Rules, Task Force on the Budget Process, Congressional Budget Process, 97th Cong., 2nd sess. (15 September 1982): 2–14; Almanac of American Politics, 1982 (Washington, DC: Barone & Company, 1981): 101. See also Zelizer, The American Congress: 678. 47Hearings before the House Committee on the Judiciary, Subcommittee on Monopolies and Commercial Law, Constitutional Amendments to Balance the Federal Budget, 96th Cong., 1st sess. (13 June 1979): 423–426. 48Bacon, Davidson, and Keller, eds., The Encyclopedia of the United States Congress, vol. 4: 1899. 49Albert R. Hunt, “The Watergate Class,” 26 March 1976, Wall Street Journal: 30. 50Almanac of American Politics, 1984: 110; “Fiscal 1980 Budget Targets,” CQ Almanac, 1979, 35th ed. (Washington, DC: Congressional Quarterly, Inc., 1980): 163–175, http://library. cqpress.com. For Gang of Five, see “First 1981 Budget Resolution: Slim Surplus,” CQ Almanac, 1980, 36th ed. (Washington, DC: Congressional Quarterly, Inc., 1981): 108–119, http://library.cqpress.com; Thomas B. Edsall, “Conflict Between Balancing Budget, Old-line Support Wracks Democrats,” 13 March 1980, Baltimore Sun: A1; William J. Eaton, “House Scuttles Budget Plan,” 30 May 1980, Los Angeles Times: 1; Martin Tolchin, “House Rejects Budget Compromise As Foes of Military Outlay Prevail,” 30 May 1980, New York Times: A1; Steven Rattner, “Conferees Approve Budget Plan for ’81 and ’80 Deficit Rise,” 12 June 1980, New York Times: A1; Andrew J. Glass, “Key House Democrats Prepare Own 1983 Budget,” 9 March 1982, Atlanta Constitution: A11; Helen Dewar, “House Approves Stopgap Spending Till End of Fiscal Year, 299 to 103,” 25 March 1982, Washington Post: A5. 51Dan Morgan, “Battling to Innovate and Emulate : Intel vs. Nippon Electric,” 2 May 1983, Washington Post: A1; “Bills Offer Protection for Chips,” 11 June 1984, New York Times: D1. 52James A. Martin, “Vendors Decry Stiff U.S. Trade Export Controls: Say Laws Protecting Sensitive Technology Cripple Access to Foreign Markets,” 27 April 1987, Computerworld: 85. 53John Hendren, no title, 16 July 1991, States News Service. 55John M. Barry, The Ambition and the Power: A True Story of Washington (New York: Penguin Books, 1990): 11. 56House Committee on Public Works and Transportation, Subcommittee on Oversight and Review, Organizational Meeting, 96th Cong., 1st sess. (27 February 1979): 2–3. 57House Committee on Public Works and Transportation, Summary of Activities, 96th Cong., 2nd sess., H. Rept. 1565 (2 January 1981): 43–46. 58House Committee on Public Works and Transportation, Summary of Activities, 97th Cong., 2nd sess., H. Rept. 1013 (3 January 1983): 7, 16–18. 59House Committee on Public Works and Transportation, Summary of Legislative Activities, 101st Cong., 2nd sess., H. Rept. 1007 (2 January 1991): 3–5, 77–80. 60Hearings before the House Committee on Public Works and Transportation, Subcommittee on Surface Transportation, Americans With Disabilities Act, 101st Cong., 1st sess. (20 September 1989): 2. 61Bill Anderson, “Cities and U.S. Tussle over Powers,” 7 December 1973, Chicago Tribune: 16. 62House Committee on Public Works and Transportation, Summary of Legislative Activities, 102nd Cong., 2nd sess., H. Rept. 1071 (16 December 1992): 81–89. 63Politics in America, 1992 (Washington, DC: Congressional Quarterly Inc., 1991): 193, 948; Politics in America, 1994 (Washington, DC: Congressional Quarterly Inc., 1993): 147. 64Congressional Directory, 103rd Cong. (Washington, DC: Government Printing Office, 1993): 460. 65House Committee on Public Works and Transportation, Summary of Legislative Activities, 103rd Cong., 2nd sess., H. Rept. 877 (22 December 1994): 3. 67Al Kamen, “Chairmen Battle Over Transportation Bill,” 28 June 1993, Washington Post: A17; William DiBenedetto, “House Action on Transport Bill Delayed By Dispute Over Projects,” 7 July 1993, Journal of Commerce: B3; Mark Simon, “Mineta—The Roads Warrior,” 19 July 1993, San Francisco Chronicle: A17. Quotation from Al Kamen, “Stalled in a Transportation Tug of War,” 26 July 1993, Washington Post: A15. 68Mark Simon, “Light Rail, BART Funds Imperiled,” 28 July 1993, San Francisco Chronicle: A17. 69Eric Pianin, “Turf Battle Stalls Transportation Spending in House,” 17 September 1993, Washington Post: A17; Martin Tolchin, “2 Powerful Democrats Battle Over Transportation Projects,” 22 September 1993, New York Times: B9. 70Eric Pianin, “House Frees Transportation Bill After Carr-Mineta Turf Fight,” 23 September 1993, Washington Post: A14. 71“Transportation Programs Score Big Gains,” CQ Almanac, 1993, 49th ed. (Washington, DC : Congressional Quarterly, 1994): 663–670, http://library.cqpress.com. 72“Highway Funds Meet Roadblocks,” CQ Almanac, 1994, 50th ed. (Washington, DC: Congressional Quarterly, 1995): 165–168, http://library.cqpress.com; Politics in America, 1996 (Washington, DC: Congressional Quarterly Inc., 1995): 118. 73Mineta, oral history interview: 11. 74“House Votes to Make Amends for Internment,” CQ Almanac, 1987, 43rd ed. (Washington, DC: Congressional Quarterly, 1988): 278, http://library.cqpress.com; “Internees Gain Reparations,” CQ Almanac, 1988, 44th ed. (Washington, DC: Congressional Quarterly, 1989): 80–81, http://library.cqpress.com; Bill McAllister, “Amends Sought for 1940s Internment,” 12 September 1987, Washington Post: A1; Mick Rood, no title, 16 September 1987, States News Service; Jill Lawrence, no title, 17 September 1987, Associated Press; Nathaniel Nash, “House Votes Payments to Japanese Internees,” 18 September 1987, New York Times: A15; Jill Lawrence, “Mineta Tearfully Recalls 1942 Internment as House Votes Cash Compensation,” 18 September 1987, Associated Press. 75Civil Liberties Act of 1985 and the Aleutian And Pribilof Islands Restitution Act, Part I: 34–36. 77Johanna Neuman and Ricardo Alonso-Zaldivar, “The Nation: Mineta, Cabinet’s Sole Democrat, Quits,” 24 June 2006, Los Angeles Times: A6. Papers: 1975-1996, approximately 45 linear feet. This collection consists of correspondence, memoranda, government publications, speeches, newspaper clippings, books, briefings, photographs, video and audio recordings, and meeting notes documenting Congressman Norman Mineta's involvement in the redress movement. Also included are some non-redress materials related to civil rights issues, especially as they pertain to Asian Americans and Americans from the Pacific Islands, as well as materials that document Norman Mineta's campaign activities. Norman Mineta's office staff selected materials to donate to the Japanese American National Museum, therefore, the Museum holds only a part of Mineta's congressional office files. A finding aid is available in the museum and online. Papers: 1961-2001, 428.75 linear feet. The Norman Mineta Papers, 1961-2001 (bulk 1975-1995) document the long-term political career of Norman Mineta. This collection consists of Norman Mineta's Legislative Office files and is arranged into six series: Series I. Administrative files, 1967-1995 (bulk 1975-1995); Series II. Awards & Memorabilia, 1971-1996 (bulk 1980-1996); Series III. Commerce files, 1967-1994 (bulk 1977-1994); Series IV. Public Relations & Press files, 1974-2001 (bulk 1980-1994); Series V. Subject files, 1961-1996 (bulk 1977-1995); and Series VI. Transportation files, 1974-1995 (bulk 1982-1995). Note that his district office files have been placed with the Japanese American National Museum in Los Angeles. Papers: ca. 1941-1943, 374 pages. This diary contains very few entries while Norman Mineta was in the Heart Mountain Relocation Project. Mineta, Norman Y. "Power and Seniority in the House of Representatives: A Californian's View." Four Persistent Issues: Essays on California's Land Ownership Concentration, Water Deficits, Sub-State Regionalism, and Congressional Leadership. Berkeley: Institute of Governmental Studies, University of California, 1978. "Norman Y. Mineta" in Asian and Pacific Islander Americans in Congress, 1900-2017. Prepared under the direction of the Committee on House Administration by the Office of the Historian and the Office of the Clerk, U.S. House of Representatives. Washington: Government Publishing Office, 2018.